Thursday, August 14, 2014, at 8:00 p.m.
Friday, August 15 at 8:00 p.m.
Saturday, August 16at 8:00 p.m.
Thursday, August 21 at 8:00 p.m.
Friday, August 22 at 8:00 p.m.
Sunday, August 24 at 3:00 p.m.
Don Juan in Hell is the rarely performed third act of Shaw’s philosophical comedy Man and Superman. By itself, it lasts 90 minutes (plus intermission), and depicts a spirited conversation between Don Juan, the Devil, Juan’s former paramour Doña Ana, and her father the Commander, slain by Juan while defending his daughter’s honor. This “chamber concert for four voices” debates love, war, morality, and the eternal battle of the sexes with sublime wit and devilish charm. Profound and thought provoking, while at the same time, comical and light, Don Juan in Hell is some of the most entertaining theater of the twentieth, or any other century. Almost every phrase of every speech is quote-worthy. Full of great arguments refuted by even greater arguments. Don Juan gained its fame as a stand-alone theatrical piece thanks to a 1950s concert version, featuring Charles Boyer as Don Juan, Charles Laughton as the Devil, Sir Cedric Hardwicke as the Commander, and Agnes Moorehead as Doña Ana. 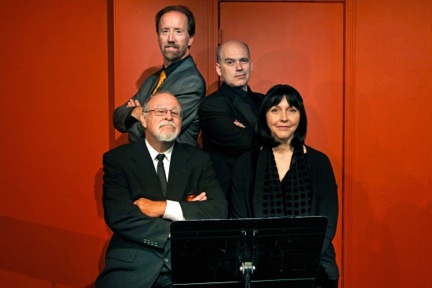 An elegant, fun-filled evening of sophisticated comedy that will leave you breathless, Don Juan in Hell has been called “wit in action” (The New Yorker); with “ideas zipping around the stage like little white Ping-Pong balls” (Denver Arts).